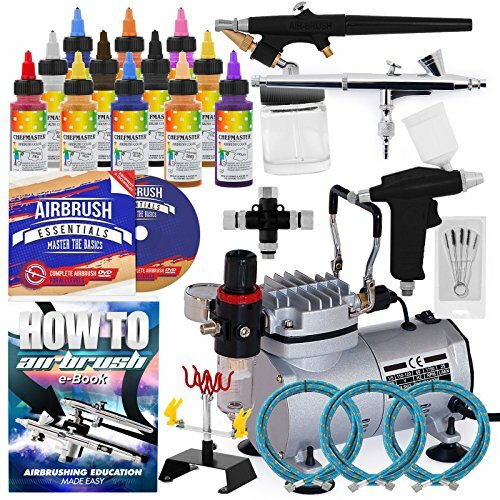 INCLUDES 12 PREMIUM CHEFMASTER PAINTS: Airbrush Cake Kit includes 12 bottles (2 ounces each) of highly concentrated, spray-on food-coloring paints from Chefmaster, made in the USA. These non-toxic, deeply pigmented paints provide superior coverage, even on hard-to-color, non-dairy whipped toppings and icings. Colors include Midnight Black, White, Royal Blue, Hawaiian Blue, Harvest Brown, Canary Yellow, Spring Green, Sunset Orange, Super Red, Violet, Blushing Pink, and Fleshtone.